Brooklyn 100% solid oak oiled Double Wardrobe with drawer. HEIGHT 1900mm WIDTH 1100mm DEPTH 545mm FREE DELIVERY WITHIN ENGLAND AND WALES. FOR SCOTLAND PLEASE CALL 01492 642224. 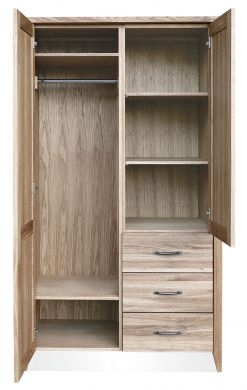 BROOKLYN OAK TRIPLE WARDROBE made with 100% solid Oak. HEIGHT 1900mm WIDTH 1100mm DEPTH 545mm This wardrobe dismantles for easy access. FREE DELIVERY WITHIN ENGLANDAND WALES. FOR SCOTLAND PLEASE CALL 01492 642224. Torino Oak Double Wardrobe Features: Timeless design Beautifully crafted using traditional methods for bedrooms as well as living areas Solid oak construction The Torino range has an oil finish showing the grain of this gorgeous oak to it’s full potential. H 1900 x W 1120 x D 620mm FREE DELIVERY TO ENGLAND AND WALES. FOR SCOTLAND PLEASE CALL 01492 642224.